Some of the most challenging skin issues I have ever tried to treat are those of women who have PCOS – polycystic ovarian syndrome. It is hard for me to forget the skin of one client who by far had the worst acne I have ever tried to help get under control or the client who told me she wasn’t going to try to treat her acne since it was caused by an internal hormonal issue (PCOS) and since there was no cure for PCOS there was nothing she could do for her acne. Both clients got me thinking – is there really nothing you can do for someone’s acne if they suffer from an internal hormonal issue? That question prompted this post. Polycystic ovary syndrome (PCOS) is a common hormonal disorder among women of reproductive age. The name of the condition comes from the appearance of the ovaries in most, but not all, women with the disorder — enlarged and containing numerous small cysts located along the outer edge of each ovary (polycystic appearance). Infrequent or prolonged menstrual periods, excess hair growth, acne and obesity can all occur in women with polycystic ovary syndrome. In adolescents, infrequent or absent menstruation may signal the condition. In women past adolescence, difficulty becoming pregnant or unexplained weight gain may be the first sign. The exact cause of polycystic ovary syndrome is unknown. Early diagnosis and treatment may reduce the risk of long-term complications, such as type 2 diabetes and heart disease. Polycystic ovary syndrome signs and symptoms often begin soon after a woman first begins having periods (menarche). In some cases, PCOS develops later on during the reproductive years, for instance, in response to substantial weight gain. Menstrual abnormality. This is the most common characteristic. Examples of menstrual abnormality include menstrual intervals longer than 35 days; fewer than eight menstrual cycles a year; failure to menstruate for four months or longer; and prolonged periods that may be scant or heavy. Excess androgen. Elevated levels of male hormones (androgens) may result in physical signs, such as excess facial and body hair (hirsutism), adult acne or severe adolescent acne, and male-pattern baldness (androgenic alopecia). However, the physical signs of androgen excess vary with ethnicity, so depending on your ethnic background you may or may not show signs of excess androgen. For instance, women of Northern European or Asian descent may not be affected. Polycystic ovaries. Enlarged ovaries containing numerous small cysts can be detected by ultrasound. Despite the condition’s name, polycystic ovaries alone do not confirm the diagnosis. To be diagnosed with PCOS, you must also have abnormal menstrual cycles or signs of androgen excess. Some women with polycystic ovaries may not have PCOS, while a few women with the condition have ovaries that appear normal. Excess insulin. Insulin is the hormone produced in the pancreas that allows cells to use sugar (glucose) — your body’s primary energy supply. If you have insulin resistance, your ability to use insulin effectively is impaired, and your pancreas has to secrete more insulin to make glucose available to cells. The excess insulin might boost androgen production by your ovaries. Low-grade inflammation. Your body’s white blood cells produce substances to fight infection in a response called inflammation. Eating certain foods can trigger an inflammatory response in some predisposed people. When this happens, white blood cells produce substances that can lead to insulin resistance and cholesterol accumulation in blood vessels (atherosclerosis). Atherosclerosis causes cardiovascular disease. Research has shown that women with PCOS have low-grade inflammation. Heredity. If your mother or sister has PCOS, you might have a greater chance of having it, too. Researchers also are looking into the possibility that mutated genes are linked to PCOS. Abnormal fetal development. Some research shows that excessive exposure to male hormones (androgens) in fetal life may permanently prevent normal genes from working the way they’re supposed to — a process known as gene expression. This may promote a male pattern of abdominal fat distribution, which increases the risk of insulin resistance and low-grade inflammation. 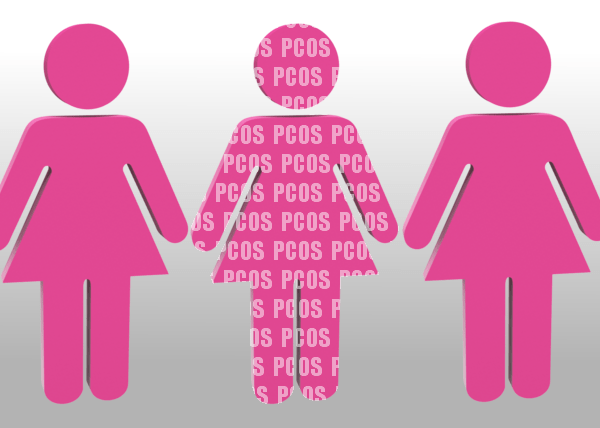 Researchers continue to investigate to what extent these factors might contribute to PCOS. If you’re willing to overhaul your diet and start a simple exercise program, you can gain a great deal of control over your PCOS symptoms. Insulin resistance causes many PCOS symptoms, and diet and exercise help control insulin resistance. If you’re overweight, lose weight by limiting yourself to 1,500 calories per day. Losing weight is one of the biggest factors in controlling PCOS symptoms, particularly if you’re trying to get pregnant. Eat regular meals (but don’t pile your plate), and have a couple of small snacks during the day.Don’t let yourself get hungry. Follow a low-GI diet by substituting low-GI carbs for high-GI carbs. The glycemic index (GI) measures how a carbohydrate affects blood sugar. High-GI foods break down quickly into glucose while low-GI foods are absorbed more slowly. Low-GI foods stabilize your blood sugar, while high-GI foods cause a rapid rise in blood sugar levels. Refined sugars are high-GI foods, while fruits and vegetables are generally low-GI. Limit the fat in your diet. Cut down particularly on saturated and trans fats (including fatty meat, butter, cakes, pastries, and cookies). Use as little salt as possible. Look at labels of processed foods to try to keep your total sodium intake below 2,400 milligrams a day. Eat at least five helpings of fruit and vegetables every day. Get some physical activity every day. Half an hour is great, but an hour is even better to help keep your weight under control. Remember to start slowly and incorporate both aerobic and weight-bearing exercise into your routine. You don’t have to do all your exercise at one time — 10 minutes of exercise three times a day is just as good as 30 minutes all at once. Aim to eat little and often to keep your blood sugar under control and follow a low GI (glycemic index) diet, with little sugar of any kind, including fruit and fruit juices as well as the more obvious cakes, biscuits, etc. According to Women’s Health UK, the elevated androgen level associated with PCOS causes the production of DHT, and this leads to acne. Additionally, insulin resistance is also typically part of PCOS, and insulin resistance further increases androgen levels. This leads to even higher DHT levels, and induces more acne breakouts. Also, as PCOS women consume high amounts of refined carbohydrates, more negative changes occur in the body. Refined carbohydrates have a high glycemic index and consuming them increases your blood sugar. In response to the increase, your body produces more insulin, further increasing your androgen levels. In short, it’s a terrible cycle that needs to be broken before clear skin can make an appearance. What do I do about PCOS acne? After learning all of this information, I finally decided that I should be treating the acne problem from the inside out, reasoning that my skin is only as good as what is circulating in my body. So, after talking to my OB/GYN and a Naturopath, I started tackling my hormonal problems the natural way. I began taking Vitex (Chastetree) to balance my hormones, and began a fairly strict low carb way of eating to treat the PCOS. I stuck to plenty of fresh fruits and vegetables, ate meat and dairy, and kept my daily intake of carbohydrates below 45 grams (although this number will vary widely by person). I also made sure to drink at least 10 glasses of water every day. Needless to say, I was thrilled when my skin began clearing up after only 2 weeks. There were fewer pimples, and my skin tone was more even. Motivated and excited, I carried on with my new way of life. Within 6 weeks, my skin was completely clear and smooth – I was cured of my terrible skin. I wanted to shout it from the rooftops! After nearly 15 years of trouble skin, I had a found a way to get the skin I had always dreamed of having. Even more exciting – my PMS was practically gone, and “that time of the month” was no longer accompanied by a nightmarish number of breakouts. To this day, my skin is still free of acne, and I couldn’t be happier about it. If you have the type of acne I did, and you think you might have PCOS, talk to your doctor, and try some low carb eating and Vitex – you have nothing to lose besides your breakouts! I’ve addressed the issue of acne and diet numerous times in this blog (you can read my posts by clicking on the links below in the “further reading” section) so I am definitely a believer when it comes to linking acne and diet. Do I think that simply changing your diet if you suffer from PCOS will clear your skin? That’s a hard one to answer. PCOS is a complicated condition so while it is good to hope for the best when making lifestyle and dietary changes you might have to temper your hopes as well. Being under the care of the right doctor or naturopath can go a long way in helping you achieve clearer skin and control your PCOS. Dairy, Carbs, Sugar, and Acne: Is There a Connection? Thank you for sharing your story. It is always great to get a personal perspective on a post. Polycystic ovarian syndrome is a hormonal condition that many women face. It causes medical issues like difficulty to conceive, cysts in the ovaries, and abnormal period cycle. This article highlights how PCOS can affect your skin. Hi! Glad to have stumbled upon your blog! I was wondering if you feature guest postings. Thanks and have a great day! Hi Hannah – thanks for your question. I actually write all my posts myself. I’ve never had a guest post.